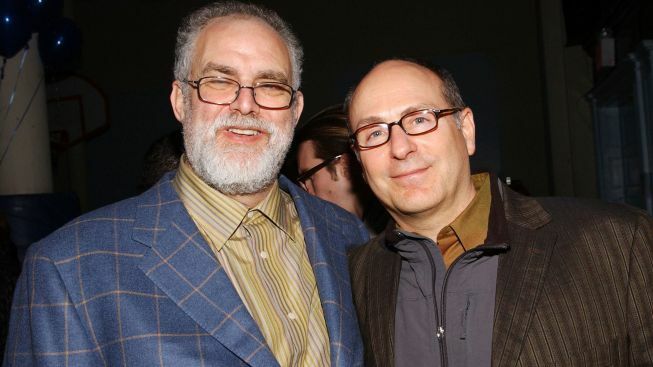 Composer William Finn and director James Lapine celebrate the opening of "The 25th Annual Putnam County Spelling Bee" in 2005. A musical take on the Oscar-winning film "Little Miss Sunshine" will open the fall season at Second Stage Theater, according to a report in The New York Times. Composer William Finn and writer-director James Lapine launched the show at San Diego’s La Jolla Playhouse in 2011, and have significantly retooled it for the New York premiere, the report says. Previews will begin Oct. 15, ahead of a November opening. "Little Miss Sunshine," which earned Academy Awards for its screenplay and supporting actor Alan Arkin, is about a family traveling cross-country to a child’s beauty pageant. The La Jolla cast featured Hunter Foster and Malcolm Gets. Finn and Lapine collaborated on "Falsettos" and, in 2005, the hit musical "25th Annual Putnam County Spelling Bee," which was first produced at Second Stage. If the show does well, a Broadway transfer could be in the works, according to the Times.